Tennis pro Serena Williams revealed Monday that her historic loss at San Jose's Silicon Valley Classic on July 31 might have had something to do with postpartum depression. 'Last week was not easy for me. Not only was I accepting some tough personal stuff, but I just was in a funk. Mostly, I felt like I was not a good mom,' the 36-year-old athlete - who boasts 24.8M social media followers said. The four-time Olympic gold medalist previously admitted she could have played 'a zillion times better' against British player Johanna Konta, who beat her (6-1, 6-0) during their 52-minute match. 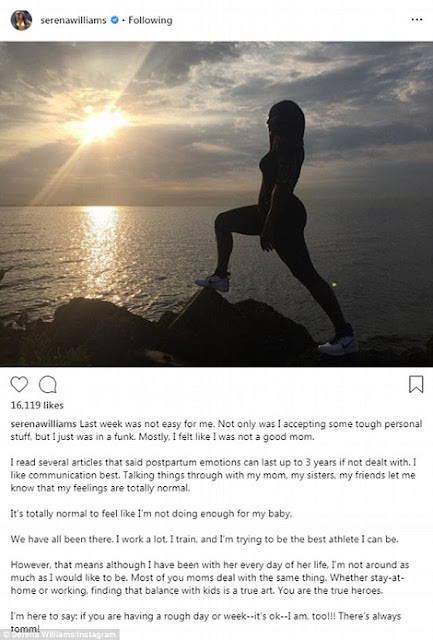 It was the fifth tournament Serena competed in since welcoming her first child with husband, Initialized Capital General Partner Alexis Ohanian Sr.
'I have so many things on my mind, I don't have time to be shocked about a loss,' Williams shrugged on August 1.